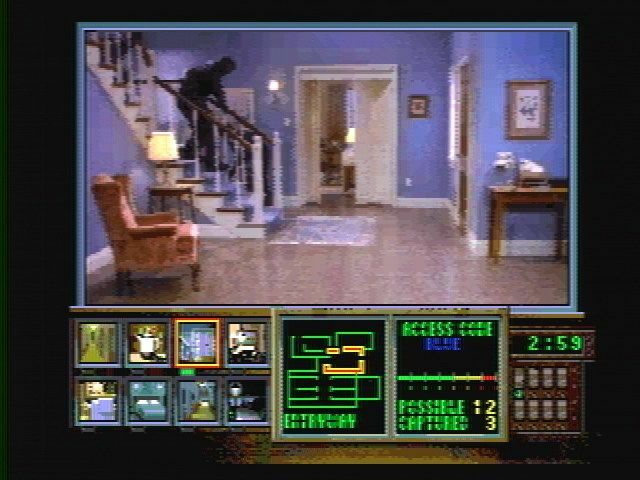 Night Trap is a Full Motion Video (FMV) game that was also released on the Sega CD in 1992. Your mission takes place at a lakeshore winery house and the objective is to protect a group of teenagers from incoming perpetrators. To do this, you need to constantly switch between eight surveillance cameras, snoop on conversations to find clues, hunt for bad guys and set off traps when necessary. These traps can only be activated when the sensor metre is in the red (otherwise your control will be temporarily locked) and you must also listen out for the ever-changing access code in order to actually use them. Unfortunately, despite an upgrade in quality compared to the Sega CD version, it's possibly the worst looking Sega 32X-CD game due to the low frame-rate and grainy video. The gameplay involves lots of trial and error, as the scenes don't follow any logical pattern; it's not always clear what to do or which room to switch to next, and you're always bound to miss something important when choosing to either follow the story or capture criminals. Finding a good balance between gameplay and story is tough, as while flicking through cameras like a madman is partially effective, you'll likely miss a change to the access code, resulting in a quick Game Over. (in my opinion, a simple hint option would have been extremely beneficial to give newcomers at least some guidance). This does mean that lots of replayability is on offer, but how much enjoyment you get from the gameplay depends on how patient you are. At least the cheesy B movie style murder scenes are humorous! The HUD is also neatly condensed onto the lower part of the screen and the camera load times are brief. There's no doubting that Night Trap is an ambitious concept, but its rigid gameplay and severe trial and error results in an aggravating experience that's unlikely to hold your attention for too long. Truth be told, there's barely any depth to its gameplay and the memorisation requirement will be a turn-off to all but a select audience. Random trivia: In 2017, the game was remastered and published on Microsoft Windows and the PlayStation 4.